Which Type Of Grass Should I Plant In Orlando? St. Augustinegrass is definitely the most common grass you’ll find in Orlando. It is accustomed to warm weather climates and grows easily on a variety of soils. It’s shade is green to blue-green, and it grows in a dense custom. Downfalls are that it requires quite a bit of maintenance, generally 4 fertilizations per year plus consistent irrigation during hot weather. You’ll also need to mow frequently (weekly). Mowing too infrequently and watering improperly will likely result in a thatch buildup. Also, it is subject to cultural and pest problems. The best time to plant St. Augustinegrass in Orlando is either Spring or Fall, to avoid extreme weather during establishment. There are also a few different types of St. Augustinegrass: Floratam, Palmetto, Del-Mar, and Seville,.If you choose St. Augustinegrass, you’ll be in good company, as most of the area has it. Also known as flatgrass, carpetgrass is is native to the Gulf Coast states and other tropical climates. Mainly planted in wet areas, carpetgrass is best established from Mid-April to May. Mowing should be frequent (about weekly), and should be done to a height of 3/4 inch to 2 inches. It doesn’t withstand foot traffic very well and has difficulty growing in the shade. You should fertilize carpetgrass at least twice per year (Fall and Spring), but probably more like 4 times per year. Carpetgrass is fairly common in Central Florida, and is a solid choice for starting a great lawn. Bermudagrass, divided into Improved Bermudagrass and Common Bermudagrass, is a turf that is well adapted to Central Florida’s climate and soils. 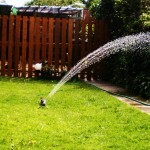 Though it is mostly used on football fields and golf courses, many homeowners use it as well. Bermudagrass, when maintained, is absolutely beautiful. It is also resilient, holding up well to foot traffic and hot climates. A word of caution, though: Improved Bermudagrass requires a high degree of maintenance. Consider fertilizing once a month, mowing twice a week, and irrigating frequently. Bermudagrass can be established quickly and produces a vibrant and dense turf. Though it can be established successfully just about any time, the prime season is between April and September. Many people consider Zoysiagrass to be the most beautiful type in the south. However, it’s not very common, at least in Orlando. Other than its aesthetics, benefits of Zoysiagrass are that it has excellent wear resistance, and it grows slowly, requiring less mowing than other types. However, it establishes super slowly (1-3 seasons), and recovers slowly from damage. It also requires frequent fertilization, probably once per month, as well as frequent irrigation. It has low drought tolerance and will recover slowly from drought damage if it occurs. It’s highly recommended that you hire lawn care professionals if you want to play Zoysiagrass. If you can maintain it, Zoysiagrass is brilliant and is sure to bring envy to your neighborhood. In Orlando, Bahia grass is the second most common – and for good reason. It started out mostly as a pasture grass, but is also used in residential and commercial lawns throughout the South. It’s mainly used when you’re starting out with dry, sandy soil, common in certain part of Orlando. It’s also drought tolerant, and doesn’t need much fertilization to maintain. It requires full sun, wilting in the shade. One big downfall is that it often turns yellow/brown in colder weather. It requires weekly mowing during the hot summer months, but not as much maintenance otherwise. Bahia grass is an excellent choice for a DIYer who doesn’t want to spend too much time primping their lawn. Centipedegrass does well in Central Florida, but it is actually the most common grass for homes in the Panhandle. It’s lighter in color, slow-growing, and doesn’t need too much fertilization. Contrarily, fertilizing Centipedegrass reduces its cold tolerance and leads to long term problems and decline. The big benefit of Centipedegrass is that its maintenance requirement is minimal. On the negative side, it’s not the prettiest turf and is susceptible to illness from certain plant parasites, namely nematodes. Seashore Paspalum, becoming increasingly popular in coastal regions, is an excellent choice for an Orlando lawn. It’s often used on golf courses, but is also common for residential lawns. First, it is very salt tolerant, and you can use poor quality water for irrigation. It grows best during summer months, and actually flourishes under a large amount of rainfall (making it perfect for Central/Southern Florida). Mowing should be done on a weekly basis, and you should only need to fertilize it twice per year. Seashore Paspalum is a great choice under specific soil conditions, especially if you are closer to the ocean. Get the free comprehensive guide to the most popular grass types in Central Florida and the best type for you and your lawn. Have further questions? Please comment below or contact us directly. LawnStarter offers high quality and reliable lawn care service in Orlando, as well as Fairfax lawn mowing and Austin lawn services. Get a free quote using our quote generator!